CEBU CITY - The adventurer- entrepreneurs and the passionate folks in doing great work to promote Cebu's natural beauty gathered on April 5, 2017 for the The Adventure Entrepreneurs + Social Media Clinic Workshop at the iioffice Cebu Co-working Space with the speakers Gene Faelnar of Cebu Mountain Bike Adventures who shared his exciting mountain bike adventures and Jing Lavilles de Egurrola of Cebu Highlands Trail Project who offered his insights and journey on crafting a mountain hike trail. The event was attended by some of Cebu’s social media influencers as well and they were able to pitch in social media tips and queries on how Gene and Jing can improve their business, promote Cebu and share the love for nature and adventure. The event was hosted by Tina Amper of TechTalks.ph, and first order of business was the introduction to everyone about the people behind the event and the speakers. Then later on, Jing and Gene individually shared their respective businesses, what they liked best about it, and the business challenges they encounter in social media. Feedback from the social media professionals immediately followed on how Jing and Gene can improve their social media strategy and promote their business online. After the open forum and attendees’ discussion, it was clear that Jing and Gene needs help in improving their social media and on how they can strategize their social media content to benefit them in the longer run. Insightful ideas and helpful strategies were given to Jing and Gene as well that would create changes for them in doing their businesses online in the future. 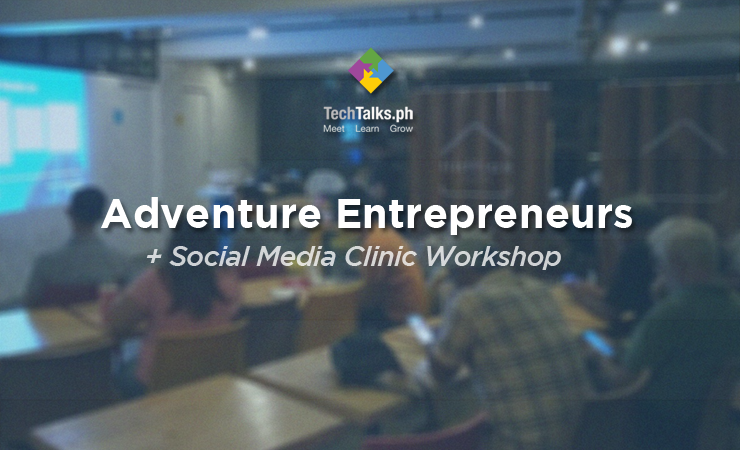 The event was opened to anyone interested in adventure /tourist activities in Cebu, who are also interested in social media/digital marketing and in SMEs. The goal of the event is to help publicize the efforts of Jing and Gene, and to connect them with possible Social Media experts to help their advocacies, promote Cebu and share the love. If you want to continue learning, discussing and talking about anything under startups and technology, please connect with TechTalks.ph for more information.